With result objects of analyses made using IBM SPSS Statistics, the creator of the report will finally be able to prepare information adjusted to the needs of the recipient with ease. Some definable elements of the report are: layout, structure and navigation, style, appearance, format, and descriptions and comments to objects. You can prepare the report as per your corporate standard. The finished report may be published on the company website, corporate portal or simply sent as a PDF to selected people depending on the form you chose. 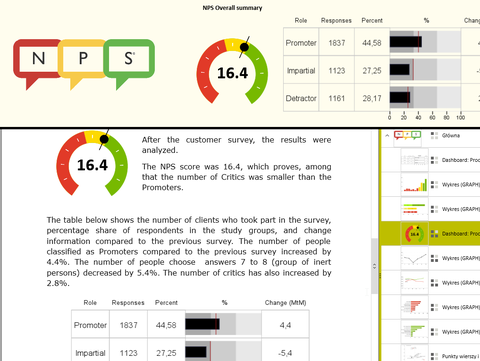 PS IMAGO Designer produces powerful reports tailored to the viewer’s visual preferences, using custom styles and backgrounds, and strategic arrangement of result objects (tables, charts, graphics) in the report. The report structure, once created, may be re-used as is, or used as a basis for other documents and reports. 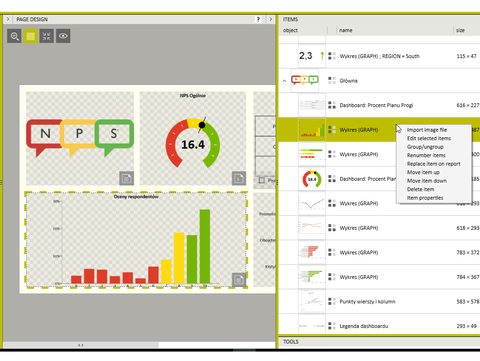 Reports prepared in the form of a dashboard are a proven method of conveying - in a synthesized manner information that is essential to an organization’s management board. Sometimes, however, an analyst needs to prepare an additional, more detailed report which contains deeper insights. 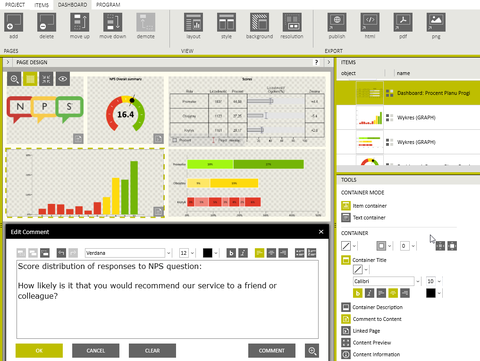 PS IMAGO Designer allows for the simultaneous creation of a document that may contain the same elements as the dashboard, but complemented by a more detailed analysis. 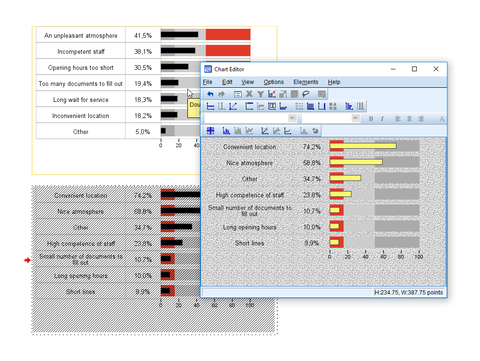 Result objects, comments and conclusions used during dashboard creation, may be automatically added to the document report, significantly speeding up the overall reporting process. The user may easily switch between dashboard and document mode, allowing both report formats to be developed simultaneously eliminating the need to switch between separate applications. The final report may be easily saved in one of several popular file formats, such as PDF, docx or HTML, and then distributed to multiple recipients e.g. as an email attachment. 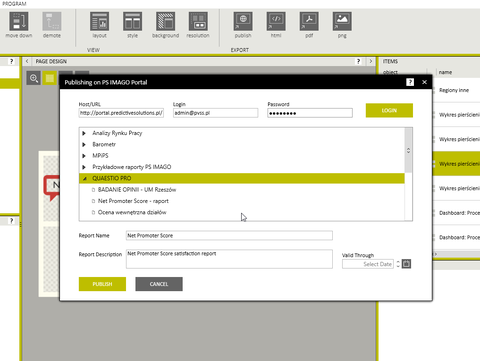 It is also possible to publish the report via a dedicated on-line platform – PS IMAGO Portal. PS IMAGO Portal features an intuitive content update mechanism that allows the report viewer to have constant access to the most recent version of the report via a regular web browser. Analytical objects contained in the report may be edited even if the author does not have access to the underlying database and/or analytical tool with which the result object was created. Having only the report at their disposal, the author can make changes to chart coloring, edit category labels, or change the table layout. All this is possible at the report design level, without the necessity of generating the object all over again. 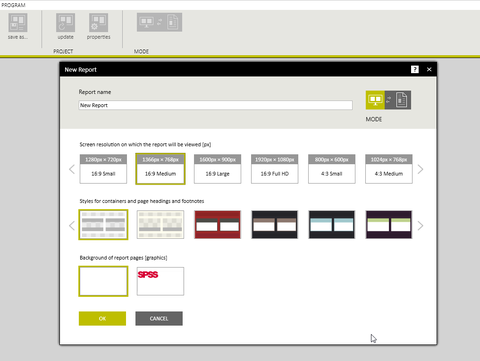 During the report design phase, PS IMAGO Designer allows many ways to interact with the report objects: Users may add comments and titles to specific result items; descriptions of report containers and objects may be added; links to subpages containing more details may be embedded. This way, the user may intuitively build advanced analytical reports, tailored to the needs of the most demanding reader. In the case of large reports containing many analytical objects, the user may create groups of objects, classify them, add comments, replace objects in a report, or quickly preview the content of an object and make edits to it. This makes it possible - even for a beginner - to manage analytical objects and create multi-level reports with many elements, with ease.